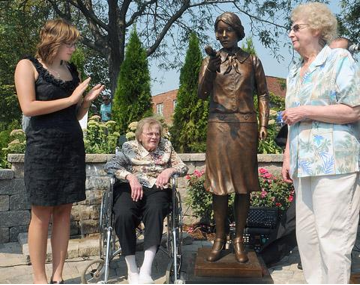 On Friday, September 2, in Ottawa, Illinois, on the site of the old Radium Dial plant a life-sized bronze statue of a young woman holding a flower in one hand and a paint brush in the other was unveiled. She is the symbol of the Radium Girls, the women workers in the watch and clock factories that dotted this area in the 1920s through 1940s. Their job was to paint those glow-in-the dark dials so popular in the day. To do this, management told them to shape a sharp point by licking the brushes soaked with deadly radium. Ottawa was a big center for this industry. Surviving employees Toots Fuller and June Menne presided over the unveiling. By 1925, manufacturers were aware of the toxic effects of radium, but said nothing to their employees and took no precautions. Many of these workers died agonizing deaths from the effects of radium poisoning. They say that if you pass a Geiger counter over their graves in the Catholic cemetery outside Ottawa it will still tick a warning. Seven of the dying Ottawa women initiated a lawsuit against the company in 1934. They were dubbed the “society of the living dead,” racing the clock against a slow and cumbersome legal system for their justice. The case eventually made it to the Supreme Court, which ruled in the women’s favor. More importantly, their struggle was critical in helping to change workers’ compensation laws and workplace safety standards. In 1980, Ottawa became an EPA superfund site. Of a dozen radioactive sites, two remain to be cleaned up for “lack of funds,” according to the EPA. It is estimated that one site on the outskirts of town will take five years and $80 million to clean – no word from the federal government on when or if this will happen. But the pressure is on from a united community.